“He was your loyal servant. You knew that he would protect you as he had protected you from your childhood. He was your keeper of the keys." "That says it," old Sam Holt cried. "Keeper of the keys. For sixty years Ah Sing had been slammin' the doors on the Ward family skeletons, an' turnin' the keys on them. I know all about it--don't I, Dudley? An' he'd a' done it this time--only Inspector Chan had his foot in the door." In the high mountains near Lake Tahoe, a delighted Charlie Chan is exposed to snow for the first time in his life. 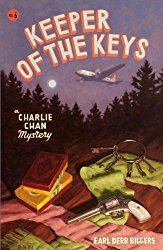 Dudley Ward invites Charlie Chan to visit his Pineview estate, which is near Lake Tahoe. In addition to Charlie, Dudley has invited his ex-wife Ellen Landini and her other ex-husbands (John Ryder, Frederic Swan, Luis Romano, Michael Ireland) and Ellen’s current husband Hugh Beaton who, at 22 years old, is younger than any of Ellen’s previous ex-husbands. The cook (Mrs. O’Ferrell), a Chinese servant named Ah Sing, and Jim Dinsdale are also present on the premises. Hugh’s sister, Leslie Beaton, as well as Michael Ireland’s current (and jealous) wife Cecile are also present. So are Sam Holt—who is 78 years old and was Sheriff for forty years. Sam’s son Don Holt is the current Sheriff; to avoid any perception of nepotism, Don followed the proper protocol of getting elected to the position. Coffee was finally brought, and then a tray of cut-glass decanters was set before Dudley Ward. "I have here, gentlemen," he remarked, "some Benedictine, creme de menthe, peach brandy. Also, some port wine. All pre-prohibition—you break no law in my house. What will you have? Just a moment--Sing! Where the devil is that boy?" He rang the bell, and the old Chinese hurriedly returned. "Sing--take the gentlemen's orders--and fill them. And now--"
He paused, and they all looked at him expectantly. "Now, gentlemen, you are wondering why you are here. You are wondering why Inspector Chan, of the Honolulu Police, is here. I have kept you waiting an intolerably long time, I know, but the truth is, I am loath to bring this matter up. To introduce it properly I shall have to go into a subject that I had hoped was for ever dead and forgotten--my life with Ellen Landini." He pushed his chair back from the table, and crossed his legs. "Sing—you haven't overlooked the cigars? Ah, yes--gentlemen, help yourselves. I—I married Ellen Landini nearly twenty years ago, in San Francisco. She had just come to town from the islands, a young girl of eighteen, with a voice--even then it was magical. But she had more than the voice, she had a freshness, a vivacity, a beauty--however, I needn't go into her charm, surely not in this company. She gave a little concert, I saw her, heard her sing. The courtship was brief. We were married, and went to Paris on our honeymoon. "That year in Paris--I shall never forget it. I want to be fair. She was wonderful--then. She studied with the best teacher in Europe, and what he told her about her voice made her supremely happy. It made me happy, too--for a time. "Only gradually did I come to see that this wonderful year had wrecked my dreams--my hopes for a home, for children. Domestic life was now impossible for us. She was determined to become a professional singer. I saw myself, the prima donna's husband, carrying a dog about Europe, waiting at stage doors, enduring for ever an artistic temperament. The career did not appeal to me. I said so. "Perhaps I was unreasonable. I want, as I have said, to be fair to her. Men were not so complacent about careers for their wives in those days. At any rate, there began a series of endless quarrels. I brought her home from Paris, to San Francisco, and thence, since it was spring, up to this house. I could see she would never be reconciled to the life I wanted." He was silent for a moment. "I apologize humbly," he went on, "for dragging you into affairs that should be private. I must add, however, that our quarrels became daily more bitter, that we began to say unforgivable things, to hate each other. I could see her hate in her eyes when she looked at me. One June day--in this very room--matters came to a climax and she left the house. She never returned. "I refused to divorce her, but when, nearly a year later, she applied for a divorce in some middle-western state, on a false charge of desertion, I did not contest the suit. I still loved her--or rather, the girl I thought I had married--but I realized she was lost to me for ever. I balanced the account and closed the books." He turned to the doctor. "Doctor Swan--won't you try that brandy again? Just help yourself, please. So far, gentlemen, you can see no reason for my story. But there is something more--and only within the past ten days have I come upon the trail of it. "I have been told, by some one who ought to know, that when Ellen Landini left my house she carried with her a secret which she had not seen fit to divulge to me. I have heard, from a source I believe reliable, that less than seven months after she left this place, she gave birth to a child, in a New York hospital. A son. Her son--and mine." Ellen Landini is wealthy. Her murder provides a number of suspects. Chan smiled. "We will leave him in your care for the present, Mrs. O'Ferrell, and I'm sure he could not be in kinder hands. That is all. I suggest you retire for the night." "Thank ye kindly, sir, but I'll not rest in me bed until this wild murderer is caught. Ye'll move as fast as ye can, I hope." Charlie shook his head. "We must collect at leisure what we may use in haste," he explained. "The fool in a hurry drinks his tea with a fork." He and Holt went into the passage. At the foot of the back stairs, Holt stopped. "A lot we got out of that," he remarked glumly. "You think so?" Chan asked. The sheriff looked at him suddenly. "We didn't get anything, did we?" Charlie shrugged. "He who fishes in muddy waters can not tell the great catch from the small." In this sixth and final Charlie Chan novel, Earl Derr Biggers is at his height in telling a complicated but very readable tale. As the plot develops and new information is discovered suspicion shifts from one possible murderer to the next. Unfortunately, Earl Derr Biggers suffered a heart attack and died a year after publishing this book, precluding further canonical stories of Chan. But the Charlie Chan films were well underway and continued for years. A television series was made in the 1950s, an animated television series was created by Hanna-Barbera and shown on television in the 1960s, and two final films were made—The Return of Charlie Chan (made for television in 1973 but broadcast in 1979) and Charlie Chan and the Dragon Queen ( a spoof) was released to theaters in 1981. Novelizations of both of these films were published, and several other novel-length pastiches were also published. The movie Charlie Chan and the Dragon Queen ended the appearance of Chan in any medium, for reasons which will be discussed elsewhere on this website.